It took about ten minutes for me to get the dust off the blog before getting started. October was my last post? How could that be? I feel embarrassed. I also feel supported by all the people who have stuck around even though I haven’t been present. Thank you from the bottom of my heart. Sincerely. I will attempt to not wait another nine months before coming back and will fill you in then on where I’ve been. For now, let’s talk berries! 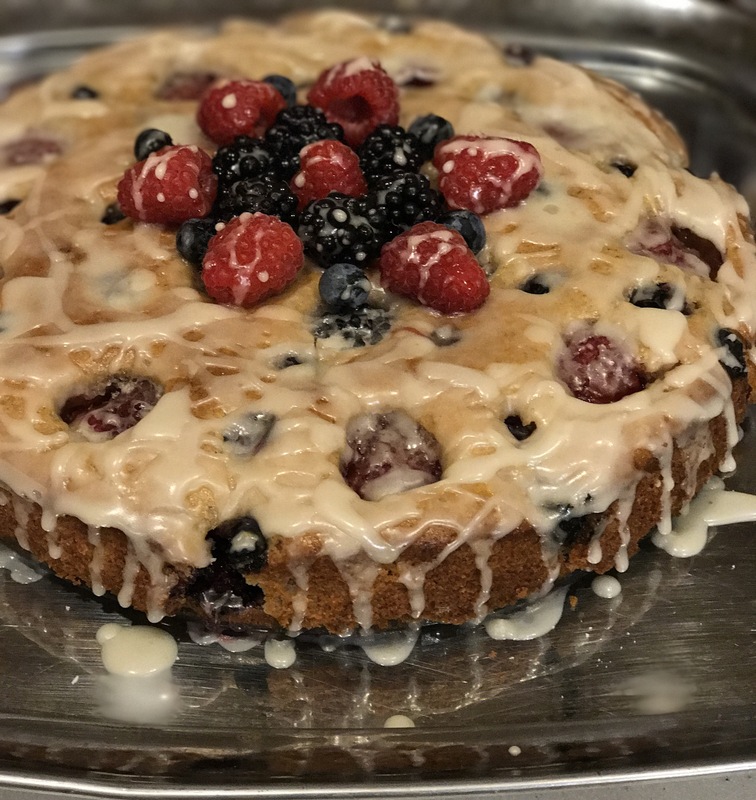 Here in the Pacific NorthWest berries are growing everywhere and Phillip needed a birthday cake for the only other vegan at his work so instead of going to the store I went berry picking. I was happy with the results and decided to share. *Gluten Free – simply swap out the flour with your favorite Gluten Free variety and bake closer to 50 minutes probably longer if not using a convection oven. Buckle cakes are one of the easiest to make, decorating skills are not needed, and they are always a crowd pleaser. You can also use stone fruits instead of berries. Ok, before doing anything mix your flax meal with the water using a fork or whisk and refrigerate for at least 15 minutes. Preheat oven to 350 degrees. Grease a 9″ spring form cake pan. For a buckle cake it needs to be a springform for presentation. You will need two bowls for the next step. One large and one medium. In the large bowl mix ingredients from flour to baking powder. Create a hole in the center of the flour mix and set aside. For this next step I used a Cuisnart Smart stick, if you don’t have a wand of some sort you will want to use a mixer because this part of the recipe needs to get foamy. In the medium bowl mix ingredients from brown sugar to maple syrup with a spoon. Pour in flax mixture and with mixer of choice mix for a minute or so until it becomes foamy. 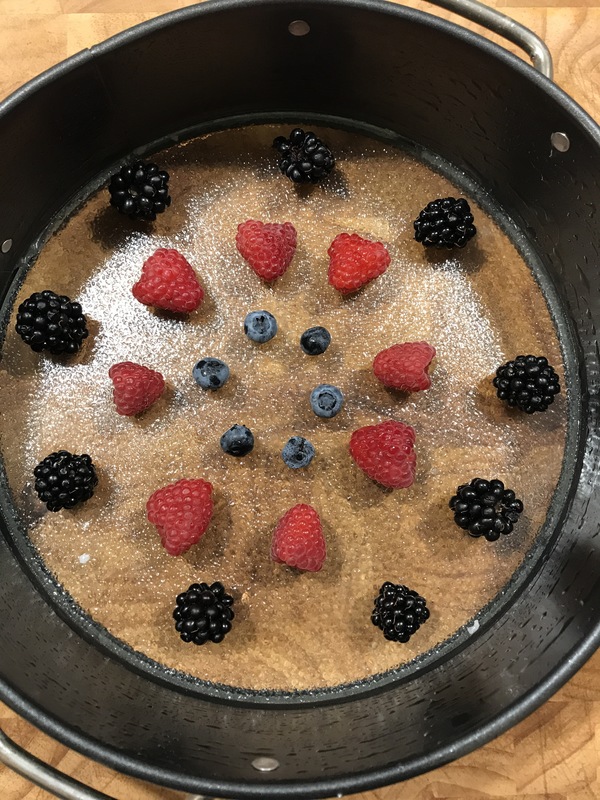 Arrange some of your fruit on the bottom of the cake pan. Pour liquid mixture into the hole you left in the flour mixture and fold until well blended. This is a very thick batter so don’t be alarmed. Pour batter into cake pan and with a spatula spread around so it covers evenly. Tap bottom in order to get out air bubbles. Press berries in cake fairly close together. Remember to leave some for the top of the cake. Bake for 40 minutes (convection oven) until the cake is pulling away from the side of the pans and a tooth pick comes out clean when stuck in the middle. Cool for thirty minutes. While the cake is cooling make glaze (directions below.) Remove spring form pan. I leave my cake sitting on the bottom of the pan. To make the glaze mix all ingredients with a fork until smooth. Drizzle 3/4 over cake after sprong form is removed. Arrange remaining fruit on cake as desired. Drizzle remaining glaze over the fruit. This looks so delicious. I now have a reason to attempt a gf dessert (mother-in-law) so this will come in very handy. Wish me luck…and thank you! I’m saving this recipe because it looks wonderful and you said it’s easiest to make! I’m a known failure in the kitchen and only had success in only a few cookie recipes. I love desserts and I’d love to be able to make delicious ones at home!